When an idea takes hold, nothing can stop it! There, did you think to kill me? There's no flesh or blood within this cloak to kill. There's only an idea. Ideas are bulletproof. Farewell. 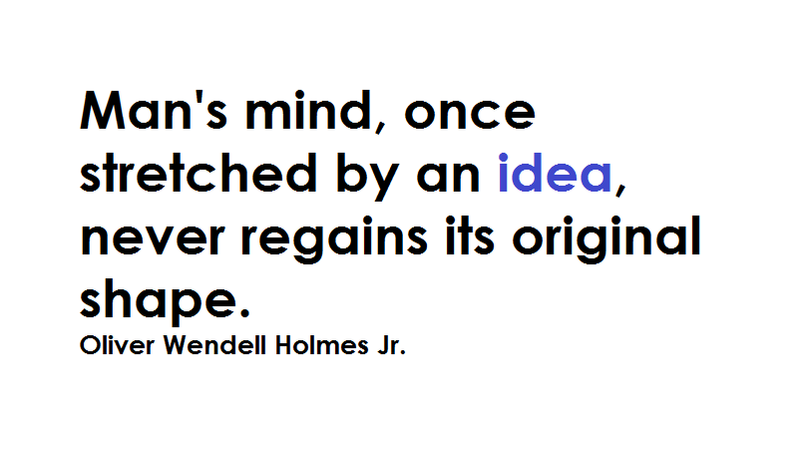 Man's mind, once stretched by an idea, never regains its original shape. You can kill a man but you cant kill a idea. The men of pure-hearted and open-minded feel no worry about running out of new ideas. Ideas are seeds of existence in absolute emptiness. Creative words are the building blocks of such ideas. In so doing, the idea forces itself upon him that religion is comparable to a childhood neurosis, and he is optimistic enough to suppose that mankind will surmount this neurotic phase, just as so many children grow out of their similar neurosis. In wars amongst ideas, doubters are the victims. My ideas will not be discussed, they will be executed. What I can't understand is why the silly things you say makes so much sense. "I'll tell you why," said Papa Dima. "It's because the best idea is the idea you least expect. And the unexpected always seems silly at first. Ideas are like legs: what good are they if you can't run with them, or spread them? As long as our ideas are the same, we will never be apart. Once a man gets a fixed idea, there's nothing to be done. More powerful than the mighty armies is an idea whose time has come. Eye can only see something if idea about it has been in mind. I don't buy 'regret' idea. I need life's good lesson. Integrity is the ability to stand by an idea. The truth that we hide is naked, the one that we flaunt is so well dressed! At beyond continent of reality, there are oceans of ideas. No matter how valuable you are and your ideas, fools will certainly play both of you down, so exclude yourselves from the inflammatory environs of fools.